There are 31 ways to get around Phoenix, Arizona, and 31 of the best ways are available through an app! Choose between 6 carshare, 2 taxi, 6 rideshare, bikeshare, or 7 black car/limo companies. 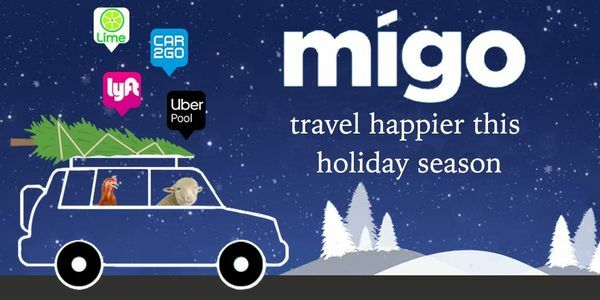 The best 4 ways to get from A to B in Phoenix are on Migo. Whether you need the closest, cheapest, or fastest ride, Migo has all of them in one app. Scroll down to see all the different transportation apps available on iTunes or GooglePlay. Choose from one of the providers below to help you get around Phoenix today. Feeling artistic? Take a trip to Burst of Butterflies studio where you can decorate your own ceramic piece! Are you a theater lover? Watch a Broadway show at the Arizona Broadway Theater, just next to the Arrowhead Towne Center. If you're after a healthy meal you won't want to miss Pomegranate Cafe, deemed one of the top 10 spots for healthy and tasty food in the country. Find a wide variety of foods from all over the world in the town of Deer Valley. Hike up to the Hole in the Rock, a geological and historical landmark! Come explore one of the 36 mulit-use trails! For a unique glimpse of the zoo, purchase tickets and do a zoo tour. Choose from guided, discovery, or custom tours, and partake in backstage adventures. If you're in need of comfort food and a local beer, head to OHSO in Terminal 2. Read about what's new at Migo in Phoenix.